I like to think if Peter Pan took place in Greece the island of Ios would be Never Land. The sun-drenched island just to the north of Santorini in the Cycladic Archipelago is the place where the ferry stops and every college student with a backpack disembarks. I came across my very own Never Land on my first trip to Greece back in 1998. I, like Peter, was spirited there by a fairy, just spelled differently than the Tinker Bell variety. I even had my very own Wendy, a 20-year-old English girl named Kate, to share the adventure with. I had met Kate a week before on Santorini. Together we found a world filled with young people who all shared a few things in common: tight budgets, an abundance of alcohol-fueled mirth, a lack of responsibility, and a wish to get laid. I had a wonderful (and dare I say magical) time chasing sea nymphs, climbing mountains and running through narrow passages with the children of the night in a bacchanalian delight. But, like when Wendy returned home from Never Land, adulthood was calling. I was finishing school and wouldn’t have weeks to lounge in the summer sun. Instead the world of work would replace those blissful days. Years later when my wife (not Kate) and I told our friend Yannis, a local Greek travel agent, we were headed to Ios he tilted his head and said in his heavily accented English, “why? It is for young people.” I was a little concerned; had I outgrown my Never Land? The answer is yes … and no, not in a million years. Here are some tips for visiting Ios even if you are too old to believe in Tink and her friends (the preceding statement was followed by vigorous clapping as to not let any fairies die from the possible lack of belief). One of Ios’ 365 churches. Ios is a 42-square-mile rock in the Aegean Sea with a permanent population of 2,024. The island, like most of Greece, has been inhabited for thousands of years. The most notable ancient resident was the mother of the Greek poet Homer. Homer himself is buried there, so I guess he is a current, permanent resident. 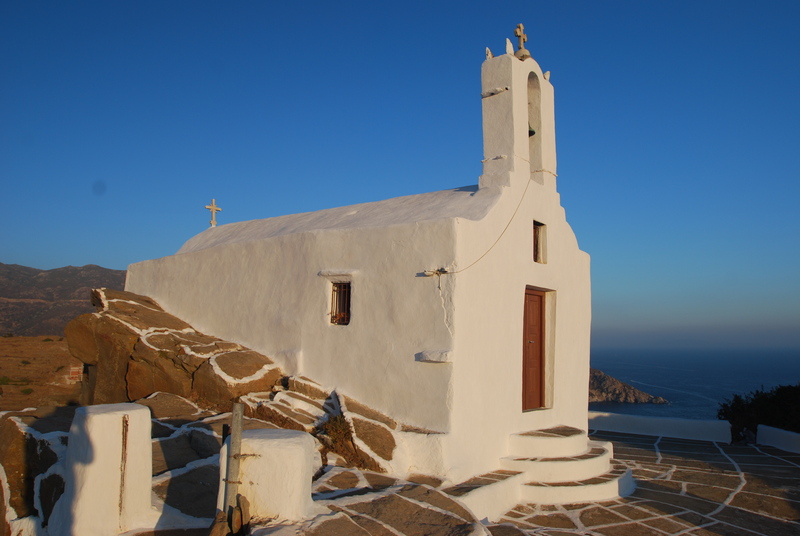 The island is also home to 365 churches; one can only guess that it’s to balance out all of the sinning that goes on by the aforementioned college kids. The main beach is Milopotas Beach, just down the hill from Chora, considered by many to be one of the best in the Aegean with its long stretch of golden sand and access to facilities such as bars, pools and tavernas. You may think it a bit crowded, but it’s not nearly as crowded as the main beaches on Mykonos or Santorini. The second most-visited beach is Manganari on the south coast of the island. It’s a great refuge from the meltemi winds, a wind from the north that peaks in the summer months and can blow at 38 miles-an-hour, enough to ruin a great beach day. You can access the beach by bus from Chora, a rather treacherous trip as I remember, or take boat. You won’t be stranded when you arrive; there are taverns just off the beach. I do remember on my first visit there was one very small tavern and not much else but a lot has changed in more than 15 years. The atmosphere on the beach is very family oriented and because of its remoteness it doesn’t get to crowded. We hopped off the boat at the rock on the left, then made our way to the beach. Manganari Beach has a church, of course. If you’re looking for true isolation, pack a lunch and plenty of water and have a boat drop you at Nero beach, a small sandy cove on the southwest side of the island. You will have the beach to yourself most of the time, though some boats on the way to Manganari will stop there to let their passengers out for a swim. One word of caution: make sure you establish a clear pick-up time with the boat you hire to get you to the beach. There’s no way off the beach other than by boat. If you’re comfortable with your nautical abilities, you may want to consider renting a skiff and sailing there yourself so you won’t be forgotten. Ios has plenty of accommodations from camping to luxury. I’m assuming that if you’re a grownup and have – you know – money, you can afford a room with its own private shower and toilet. We camped by the beach once and found ourselves a buffet for the local mosquitoes. I don’t recommend it. Here are three places that might sound good to the childless yuppie side of you. Homer’s Inn Hotel is a family-run hotel with basic but clean rooms. The pool is amazing, one of the best pools at any hotel we’ve visited. You’ll love the rates, too: between $78-$100 a night. The walk to Chora is about 10 minutes up the hill and the port is 10 minutes down the hill. I give it big thumbs up for location and value. 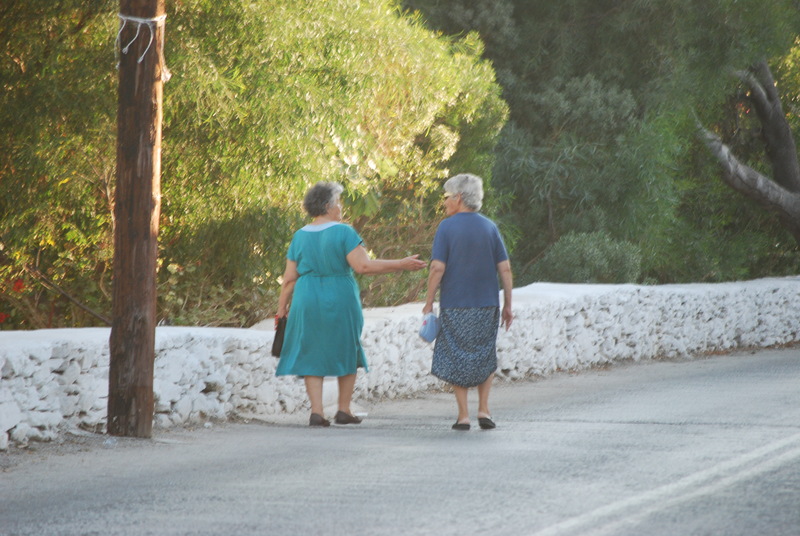 Two Yia Yias walk down the hill to the port. I have not stayed at Levantes Ios Boutique Hotel, but I have seen the exterior many times. 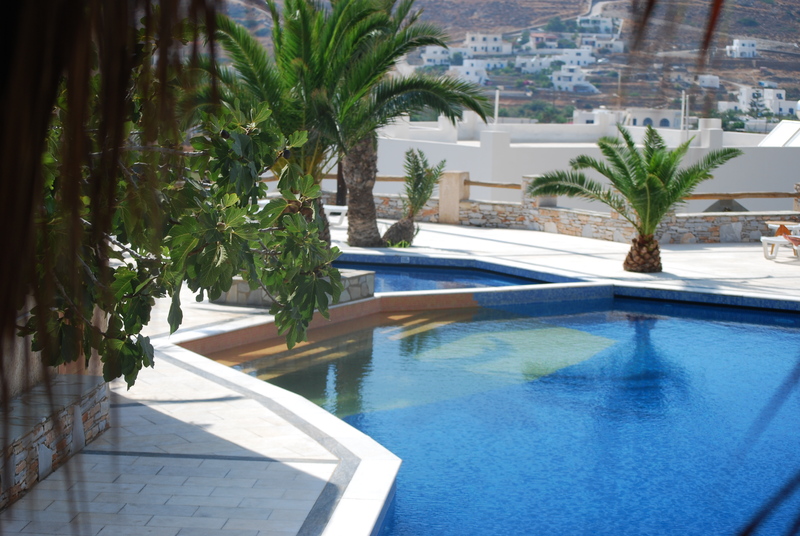 The hotel is perched on a hillside above Milopotas Beach and received several great reviews on Trip Advisor. The views from that hillside of the beach and the sea are amazing. I would love to stay there one day. The prices are equivalent for boutique hotels in the states, running about $200 a night. The Liostasi Ios Hotel & Spa serves up truly luxurious accommodations. We have never spent the night but did get to spend a week lounging by their pool due to an arrangement between the Liostasi and the pension where we were staying. You won’t find any backpackers here; the cost of $230 a night is a little out of their budget (besides, if you’re a backpacking 20-something on Ios you need every cent of for your bar tab). The location of the hotel is a 5-minute walk from Chora and the bus stops taking you to the beach or the port. I really think this hotel is worth the money, the only reason we didn’t stay there our last trip was they were completely booked. Make your plans early if this looks like the hotel for you. As usual I can’t recommend to many restaurants due the constant changes in the restaurant scene. I can recommend two places that have been around for years. Louis Tavern located on the tiny main square in Chora serves one of the best English breakfasts in Greece. The tavern has been around for more than 70 years and I don’t expect it will be going anywhere soon. I also recommend Pinocchio, a great Italian restaurant with simple Italian fare. If you don’t like crowds I recommend going out around 8:00 p.m. when it begins to cool off and you are still two hours before the party population awakes for their nocturnal merriment. The lesson? You can go to Ios as a grownup. You may not find yourself drinking flaming Lamborghinis at 2:00 a.m. because a hot Australian bartender named Jada said you should try it, then rushing down to the beach to skinny dip in the dark with total strangers… but you can still have a great time relaxing by the water, pool or sea, and soaking up the sun, all without the hangover. of the subjects you write concerning here. Again, awesome site!